I shot the Action Pistol Match last night in the May heat and managed to get two of the stages on video. I’m posting not because I’m a great shooter (I’m not, yet) but to show you that women do participate in these matches. On both Stages I have a female Range Safety Officer. Hold the camera vertically to film horizontally (old Flip camera we pass around). Stage 2: Don’t just start running with no clear destination in mind. If you can’t see the targets, pick a point on the floor to head for it. I overran the gap in the barrier and backed up to make my shot. Shooting a complicated stage can be easier the second time. I shot all of these stages on Monday of the previous week and Stage 1 took some time to figure out. Last night I shot 2nd, it was our last stage, we were all hot and tired, and we didn’t take as much time to plot strategy. I’d shot it before so I knew there were low, long shots from each corner. I split up the targets in set of 3: 3 from the initial gap, three from the left corner, a single at the right gap, and the last 3 from the right corner. For once I ran the stage as I intended. I’m still slow but all my shots were alpha or charlie (no penalty points for “alpha”, one penalty point for a “charlie”). No misses. I was very pleased with that. At one point in time Caswell Ranch took a hiatus from IDPA. I took an even longer hiatus from shooting. But I’m back and Caswell Ranch is back to offering IDPA matches the 4th Sunday of the month. This month they will be offering a 5th Sunday match – even though it’s not on the calendar. Contact info is here if you want to verify the match. I shot the match on May 24th and stuck around for a classifier after the match. We shot 6 stages on a beautiful spring day. We started with a car scenario. We shot these 4 targets through the passenger window, then exited the car and shot one target while backing away from the driver’s door, moved to the rear of the car and shot a few more. When we shot in the shoot houses, there was no way to really get good video. The other 3 are included below. I’m very new to video editing so this was the result of playing around with new video editing software. I am painfully slow at shooting one handed. But I am fairly accurate. The first shot is double action and a longer pull, but even so, that’s WAY too long. These were all headshots and some only part of a head, but even so…. 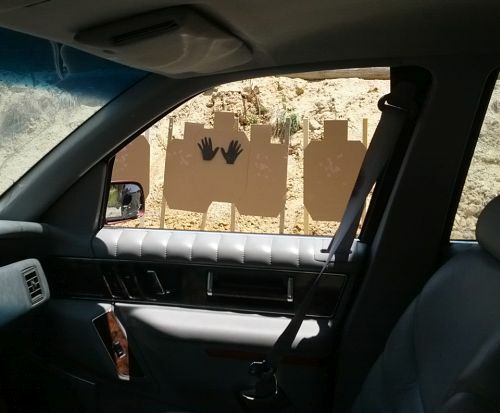 Since it’s not on the video, I included a photo of the targets. Headshots Only. One hand only. Are you kidding me? I need to learn to transition the gun from hand to hand better. When I moved from strong hand to both hands, I hand a lot of extra thumb action. I don’t have my supporting hand positioned correctly – the thumb is way too high in most cases. I need to stop pulling the magazines out of the gun. They will drop. That’s bad habit I picked up from my XDS. On the second stage I needed the front magazine (loaded to 3 rounds) but grabbed the back magazine, realized the mistake, and fixed it. I’ve never grabbed the back magazine before. So, something new to focus on during dry fire practice. On the positive side, I started the last stage looking at the first target. Thanks to Rusty for running video for me! Shoot ’em in the Logo! 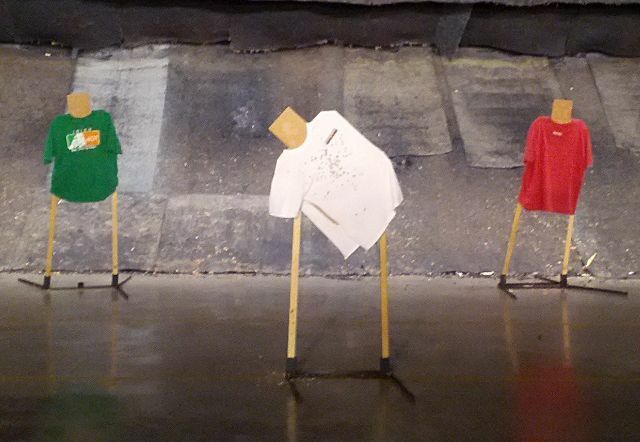 One of the stages for the May 18th (3rd Monday) match I shoot included targets with T shirts. Even though it tough to see the down zero zone on targets, this made it impossible. And more realistic. It’s more difficult to score as you have to undress the target, look for the holes, score the target, paste the holes and redress the target. This is one just one more of the reasons I shoot matches. This is one more exercise to stretch my skillset. 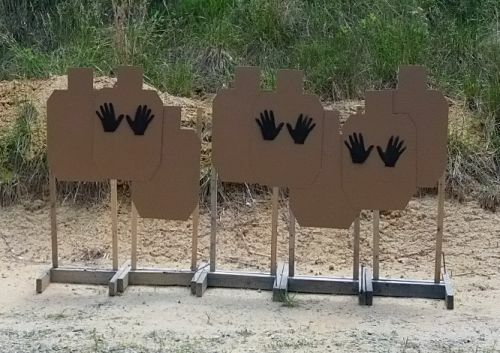 In April 2015, I shot 4 different pistols. All were 9mm but for the most part were very different guns. I started the month shooting the 1911 at an IDPA Match in Oxford. I was so frustrated with the 1911, I decided to give CCP(concealed carry pistol division of IDPA) a try and switched to the Springfield XDS. I shot a match and an IDPA Classifier hosted at the Wake County Range the 3rd Saturday with this gun. I like the way it shoots, but I find it difficult to get the magazine to drop and I pinched my palm when reloading to the point of bruises. The grip is the “perfect” height to make that an issue. I volunteered for a WOT event and had the opportunity to shoot a S&W M&P in 9mm. Not much shooting here, but enough to knock down 8 steel targets. 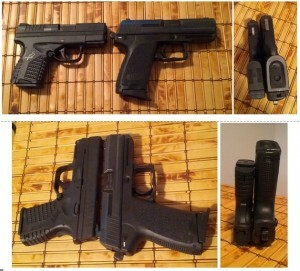 Finally,I switched to an H&K USP Compact after I shipped the 1911 to S&W. I didn’t know how long the 1911 would be gone or how well it would work when it came back. I have plans to shoot the Carolina Cup, so I needed to pick a pistol, stick with it and continue to practice. I bought the H&K about 3 years ago because it was a deal I just couldn’t turn down, however I really haven’t shot it much. It’s supposed to be reliable and after my experience with the 1911, that was appealing. I could shoot the H&K in SSP (Stock Service Pistol) if I decock it and ensure the first shot is always a double action pull. Or I can shoot it in ESP (Enhanced Service Pistol) if I put on the safety and include taking the safety off each time I draw from the holster. Since I can’t consistently reach the safety, I opted to start shooting SSP and learn how to deal with the double action trigger pull. I’ve found that to be challenging. I made the switch May 6th when I took a half day off work to work on the IDPA Classifier. I worked on that again May 9th and shot another classifier, in Oxford this time, with the H&K in SSP on May 10th (Mother’s Day). I missed qualifying as Marksman by 3 seconds. My first trigger pull is painfully slow to avoid slapping the trigger and dropping the shot. So once again, something new to work on. I also am a bit too quick with the second shot due to the contrast in the trigger weight. I haven’t measured, but I wouldn’t be surprised to find that the H&K single action pull is as light as my 1911. A final comment: When I got the 1911 back I shot it then shot the H&K. I didn’t think the H&K had much recoil until I shot them back to back… the 1911 makes it feel as if the H&K kicks. But I’m sticking with it for now. On 5/14/15, three weeks and 1 day after I sent my 1911 to S&W with a request to repair a “failure to extract” issue, FedEx rang my door bell and I signed for my gun. I happened to be home with an appliance repair contractor and that saved me a drive to the FedEx facility. FedEx will not leave the package unless they get a signature. It has a gun inside so that makes perfect sense, even if it is incredibly inconvenient in most cases. No mention of any funds due. I asked my gunsmith how this works and he said they would call if they were going to charge me to repair – to get authorization for the charges. No call was good news. Getting the gun back was better news. I had plans to shoot with a friend at the Wake County Range that night so of course I took the 1911 with me. I only put 20 rounds through it as I needed to get in practice time with my H&K, but there were no malfunctions. Excellent.